'In repentance and rest is your salvation, in quietness and trust is your strength! - but you would have none of it. You said, "No, we will flee on horses." Therefore you will flee! You said, "We will ride off on swift horses." Therefore your pursuers will be swift!' "
Remedy: Go to the Holy One no matter how difficult it is or how radical your life my have to change. The alternative is a complete overthrow. The Lord wants good for these people but since they refuse to obey and to wait for God they will receive none of his salvation and strength. God is now forced to wait on them until they have gone through disasters. Rebellion towards God not only brings disaster it keeps God’s salvation and strength away. God offers himself and they choose horses. They have planned their escape on horses. God says they will use them. The enemy will be swifter. There is always someone or something stronger or faster. Our only hope is to side with God who is always the best. Since they trusted in something weak and not worth trusting (Egypt, themselves) the fleeing will begin quickly. Once they realize their hope has failed them thousands will begin fleeing. There will be no confidence left when they see Egypt and themselves fail. The flagstaff on a mountaintop may represent Jerusalem after 701 deliverance because Jerusalem was the only thing left standing.The flag bearer during a battle holds the flag in a visible place so every one will know where to rally to during the battle or at the end. In this case, the only thing left standing is the flag bearer. Everyone else was killed. This verse shows that God is ready to be gracious when the people are ready. God is now waiting for the people to get ready. 3. God is aware of our commitment, our suffering, our waiting. Graciousness when we are ready. You can count on it. 5. When the time is right God will deliver. Rewards to those who have earned them. Chereb (Hb) - sword (Eng) - The Hebrew word chereb means “sword,” “dagger,” “flint knife” and “chisel.” Most often chereb is a weapon of war. In Exodus 20:25 chereb is a tool for hewing. I will confess and repent of my sin. I will not cover my sin, deny my sin or allow the guilt of my sin to build up. I will acknowledge my sin and look to the Lord for strength and deliverance. 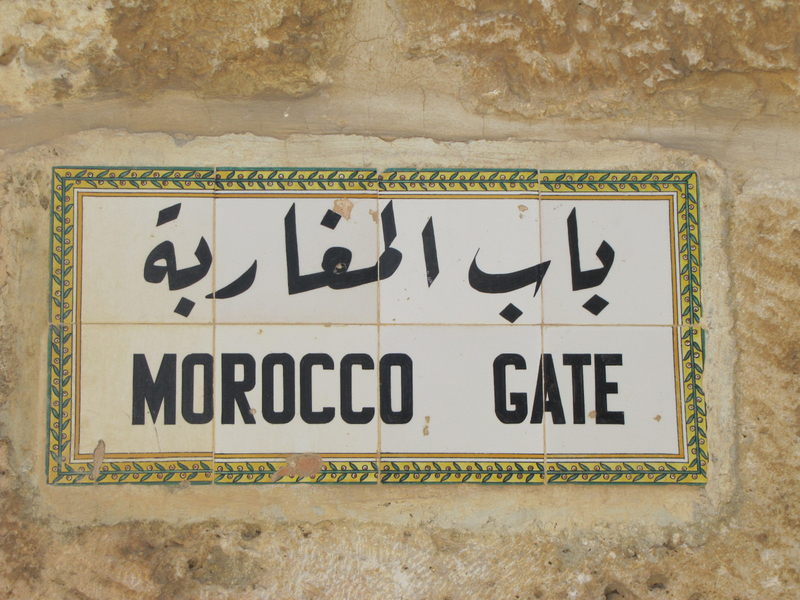 The sign on the Temple Mount for the Morocco Gate. This is the only gate today that can be used by non-muslims to access the Temple Mount. 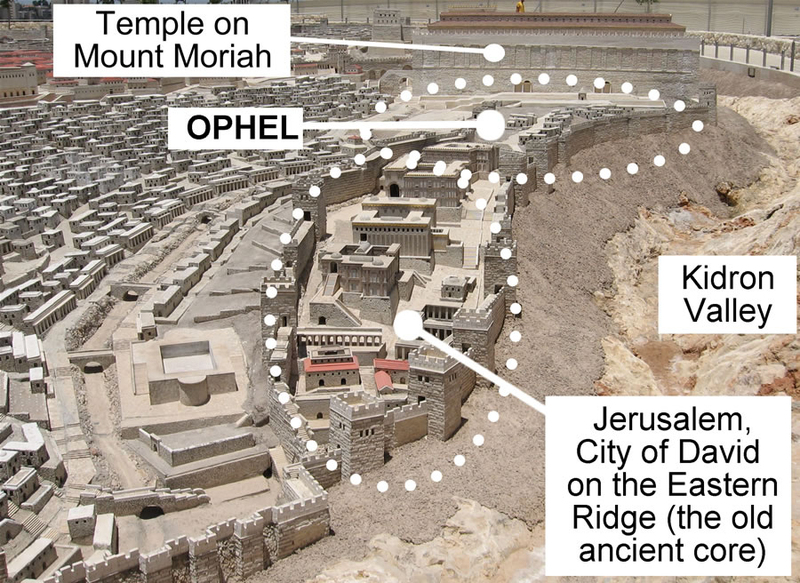 The City of David, the Ophel, the Kidron Valley and the Temple Mount are labeled on this photo of a model of the New Testament city of Jerusalem. "Our responsibility is to wait faithfully for Jesus while we serve him productively." Take the online quiz and learn more. Go HERE and click "start"
In 1 Kings 9:15-17 we are told that Pharaoh captured and destroyed Gezer and then gave it to Solomon as a wedding present. Solomon then is said to have built up the city including the gate. Excavations reveal the Egyptian destruction layer. 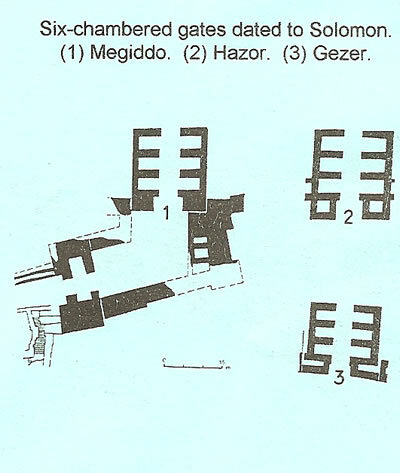 The gate system was found that matched the gates systems also built by Solomon at Hazor and Megiddo. The Lord gives sight to the eyes of both." Personal growth increases your personal potential. The failure to learn and the refusal to change is the rejection of increasing your opportunity for success. Adoniram son of Abda—in charge of forced labor. 19 Geber son of Uri—in Gilead (the country of Sihon king of the Amorites and the country of Og king of Bashan). He was the only governor over the district. 20 The people of Judah and Israel were as numerous as the sand on the seashore; they ate, they drank and they were happy. 21 And Solomon ruled over all the kingdoms from the Euphrates River to the land of the Philistines, as far as the border of Egypt. These countries brought tribute and were Solomon’s subjects all his life. 22 Solomon’s daily provisions were thirty cors[a] of the finest flour and sixty cors[b] of meal, 23 ten head of stall-fed cattle, twenty of pasture-fed cattle and a hundred sheep and goats, as well as deer, gazelles, roebucks and choice fowl. 24 For he ruled over all the kingdoms west of the Euphrates River, from Tiphsah to Gaza, and had peace on all sides. 25 During Solomon’s lifetime Judah and Israel, from Dan to Beersheba, lived in safety, everyone under their own vine and under their own fig tree. 27 The district governors, each in his month, supplied provisions for King Solomon and all who came to the king’s table. They saw to it that nothing was lacking. 28 They also brought to the proper place their quotas of barley and straw for the chariot horses and the other horses. 1 Kings 4:34 In Hebrew texts 4:21-34 is numbered 5:1-14. O God, why have you rejected us forever? Why does your anger smolder against the sheep of your pasture? Remember the nation you purchased long ago, the people of your inheritance, whom you redeemed— Mount Zion, where you dwelt. Turn your steps toward these everlasting ruins, all this destruction the enemy has brought on the sanctuary. Your foes roared in the place where you met with us; they set up their standards as signs. They behaved like men wielding axes to cut through a thicket of trees. They smashed all the carved paneling with their axes and hatchets. They burned your sanctuary to the ground; they defiled the dwelling place of your Name. They said in their hearts, “We will crush them completely!” They burned every place where God was worshiped in the land. We are given no signs from God; no prophets are left, and none of us knows how long this will be. How long will the enemy mock you, God? Will the foe revile your name forever? Why do you hold back your hand, your right hand? Take it from the folds of your garment and destroy them! It was you who split open the sea by your power; you broke the heads of the monster in the waters. It was you who crushed the heads of Leviathan and gave it as food to the creatures of the desert. It was you who opened up springs and streams; you dried up the ever-flowing rivers. The day is yours, and yours also the night; you established the sun and moon. It was you who set all the boundaries of the earth; you made both summer and winter. Remember how the enemy has mocked you, Lord, how foolish people have reviled your name. Do not hand over the life of your dove to wild beasts; do not forget the lives of your afflicted people forever. Do not let the oppressed retreat in disgrace; may the poor and needy praise your name. Do not ignore the clamor of your adversaries, the uproar of your enemies, which rises continually. Listen to me, you islands; hear this, you distant nations: Before I was born the Lord called me; from my mother’s womb he has spoken my name. He made my mouth like a sharpened sword, in the shadow of his hand he hid me; he made me into a polished arrow and concealed me in his quiver. They will neither hunger nor thirst, nor will the desert heat or the sun beat down on them. He who has compassion on them will guide them and lead them beside springs of water. I will turn all my mountains into roads, and my highways will be raised up. Shout for joy, you heavens; rejoice, you earth; burst into song, you mountains! For the Lord comforts his people and will have compassion on his afflicted ones. See, I have engraved you on the palms of my hands; your walls are ever before me. Your children hasten back, and those who laid you waste depart from you. Lift up your eyes and look around; all your children gather and come to you. As surely as I live,” declares the Lord, “you will wear them all as ornaments; you will put them on, like a bride. “Though you were ruined and made desolate and your land laid waste, now you will be too small for your people, and those who devoured you will be far away. “See, I will beckon to the nations, I will lift up my banner to the peoples; they will bring your sons in their arms and carry your daughters on their hips. Can plunder be taken from warriors, or captives be rescued from the fierce[c]? “Yes, captives will be taken from warriors, and plunder retrieved from the fierce; I will contend with those who contend with you, and your children I will save. “Where is your mother’s certificate of divorce with which I sent her away? Or to which of my creditors did I sell you? Because of your sins you were sold; because of your transgressions your mother was sent away. When I came, why was there no one? When I called, why was there no one to answer? Was my arm too short to deliver you? Do I lack the strength to rescue you? By a mere rebuke I dry up the sea, I turn rivers into a desert; their fish rot for lack of water and die of thirst. The Sovereign Lord has opened my ears; I have not been rebellious, I have not turned away. Because the Sovereign Lord helps me, I will not be disgraced. Therefore have I set my face like flint, and I know I will not be put to shame. He who vindicates me is near. Who then will bring charges against me? Let us face each other! Who is my accuser? Let him confront me! It is the Sovereign Lord who helps me. Who will condemn me? They will all wear out like a garment; the moths will eat them up. But now, all you who light fires and provide yourselves with flaming torches, go, walk in the light of your fires and of the torches you have set ablaze. This is what you shall receive from my hand: You will lie down in torment. “Listen to me, my people; hear me, my nation: Instruction will go out from me; my justice will become a light to the nations. My righteousness draws near speedily, my salvation is on the way, and my arm will bring justice to the nations. The islands will look to me and wait in hope for my arm. Lift up your eyes to the heavens, look at the earth beneath; the heavens will vanish like smoke, the earth will wear out like a garment and its inhabitants die like flies. But my salvation will last forever, my righteousness will never fail. “Hear me, you who know what is right, you people who have taken my instruction to heart: Do not fear the reproach of mere mortals or be terrified by their insults. Awake, awake, arm of the Lord, clothe yourself with strength! Awake, as in days gone by, as in generations of old. Was it not you who cut Rahab to pieces, who pierced that monster through? Was it not you who dried up the sea, the waters of the great deep, who made a road in the depths of the sea so that the redeemed might cross over? Those the Lord has rescued will return. They will enter Zion with singing; everlasting joy will crown their heads. Gladness and joy will overtake them, and sorrow and sighing will flee away. that you forget the Lord your Maker, who stretches out the heavens and who lays the foundations of the earth, that you live in constant terror every day because of the wrath of the oppressor, who is bent on destruction? For where is the wrath of the oppressor? The cowering prisoners will soon be set free; they will not die in their dungeon, nor will they lack bread. For I am the Lord your God, who stirs up the sea so that its waves roar— the Lord Almighty is his name. Awake, awake! Rise up, Jerusalem, you who have drunk from the hand of the Lord the cup of his wrath, you who have drained to its dregs the goblet that makes people stagger. Among all the children she bore there was none to guide her; among all the children she reared there was none to take her by the hand. These double calamities have come upon you— who can comfort you?— ruin and destruction, famine and sword— who can[d] console you? Your children have fainted; they lie at every street corner, like antelope caught in a net. They are filled with the wrath of the Lord, with the rebuke of your God. Therefore hear this, you afflicted one, made drunk, but not with wine. This is what your Sovereign Lord says, your God, who defends his people: “See, I have taken out of your hand the cup that made you stagger; from that cup, the goblet of my wrath, you will never drink again.